A 24-year-old man has been charged with vandalizing President Donald Trump’s Hollywood Walk of Fame Star, according to the Los Angeles County District Attorney’s Office. 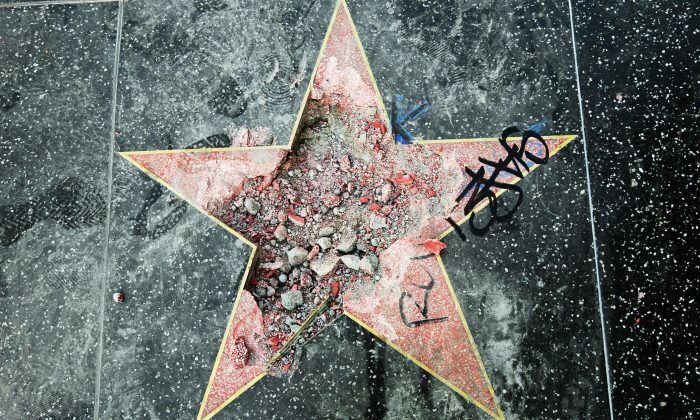 Austin Mikel Clay from Glendale, California, has been charged with one felony count of vandalism for allegedly destroying the iconic star located on Hollywood Boulevard with a pickaxe before dawn on July 25. If convicted, Clay faces a maximum of three years in jail. The DA office said in a statement that Clay then turned himself into a police department the following day. “When people are unhappy with one of our honorees, we would hope that they would project their anger in more positive ways than to vandalize a California State landmark,” Leron Gubler, president of the Hollywood Chamber of Commerce, said in a statement on July 25. Clay’s bond has been set at $20,000. He is expected to be arraigned in court on Aug. 15. The Hollywood star was previously vandalized by James Otis with a sledgehammer and pickax days before the November 2016 election. Otis was sentenced to three years of probation for vandalism, 20 days of community labor and ordered to pay $4,400 for the damage. Otis told TMZ in July that he would like to pay for Clay’s bail.